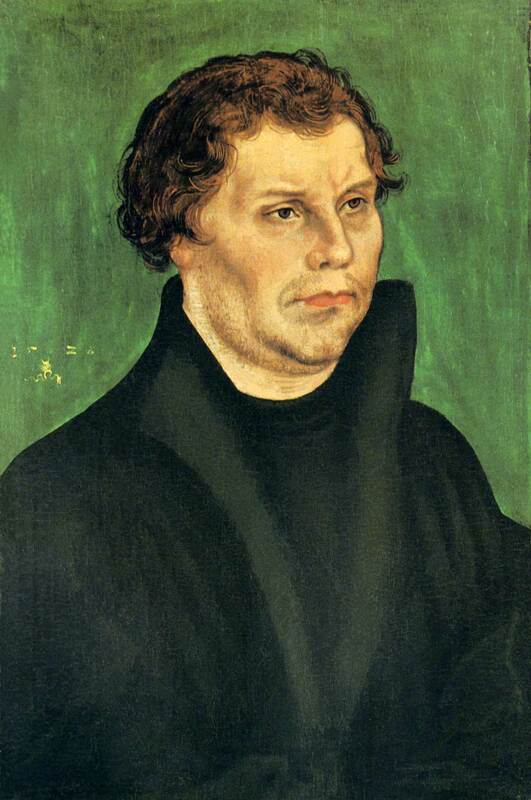 Out of love for the truth and the desire to bring it to light, the following propositions will be discussed at Wittenberg, under the presidency of the Reverend Father Martin Luther, Master of Arts and of Sacred Theology, and Lecturer in Ordinary on the same at that place. Wherefore he requests that those who are unable to be present and debate orally with us, may do so by letter. In the Name our Lord Jesus Christ. Amen. 1. Our Lord and Master Jesus Christ, when He said Poenitentiam agite, willed that the whole life of believers should be repentance. 2. This word cannot be understood to mean sacramental penance, i.e., confession and satisfaction, which is administered by the priests. 3. Yet it means not inward repentance only; nay, there is no inward repentance which does not outwardly work divers mortifications of the flesh. 4. The penalty [of sin], therefore, continues so long as hatred of self continues; for this is the true inward repentance, and continues until our entrance into the kingdom of heaven. 5. The pope does not intend to remit, and cannot remit any penalties other than those which he has imposed either by his own authority or by that of the Canons. 6. The pope cannot remit any guilt, except by declaring that it has been remitted by God and by assenting to God’s remission; though, to be sure, he may grant remission in cases reserved to his judgment. If his right to grant remission in such cases were despised, the guilt would remain entirely unforgiven. 7. God remits guilt to no one whom He does not, at the same time, humble in all things and bring into subjection to His vicar, the priest. 8. The penitential canons are imposed only on the living, and, according to them, nothing should be imposed on the dying. 9. Therefore the Holy Spirit in the pope is kind to us, because in his decrees he always makes exception of the article of death and of necessity. 10. Ignorant and wicked are the doings of those priests who, in the case of the dying, reserve canonical penances for purgatory. 11. This changing of the canonical penalty to the penalty of purgatory is quite evidently one of the tares that were sown while the bishops slept. 12. In former times the canonical penalties were imposed not after, but before absolution, as tests of true contrition. 13. The dying are freed by death from all penalties; they are already dead to canonical rules, and have a right to be released from them. 14. The imperfect health [of soul], that is to say, the imperfect love, of the dying brings with it, of necessity, great fear; and the smaller the love, the greater is the fear. 15. This fear and horror is sufficient of itself alone (to say nothing of other things) to constitute the penalty of purgatory, since it is very near to the horror of despair. 16. Hell, purgatory, and heaven seem to differ as do despair, almost-despair, and the assurance of safety. 17. With souls in purgatory it seems necessary that horror should grow less and love increase. 18. It seems unproved, either by reason or Scripture, that they are outside the state of merit, that is to say, of increasing love. 19. Again, it seems unproved that they, or at least that all of them, are certain or assured of their own blessedness, though we may be quite certain of it. 20. Therefore by “full remission of all penalties” the pope means not actually “of all,” but only of those imposed by himself. 22. Whereas he remits to souls in purgatory no penalty which, according to the canons, they would have had to pay in this life. 23. If it is at all possible to grant to any one the remission of all penalties whatsoever, it is certain that this remission can be granted only to the most perfect, that is, to the very fewest. 24. It must needs be, therefore, that the greater part of the people are deceived by that indiscriminate and highsounding promise of release from penalty. 25. The power which the pope has, in a general way, over purgatory, is just like the power which any bishop or curate has, in a special way, within his own diocese or parish. 26. The pope does well when he grants remission to souls [in purgatory], not by the power of the keys (which he does not possess), but by way of intercession. 27. They preach man who say that so soon as the penny jingles into the money-box, the soul flies out [of purgatory]. 28. It is certain that when the penny jingles into the money-box, gain and avarice can be increased, but the result of the intercession of the Church is in the power of God alone. 29. Who knows whether all the souls in purgatory wish to be bought out of it, as in the legend of Sts. Severinus and Paschal. 30. No one is sure that his own contrition is sincere; much less that he has attained full remission. 31. Rare as is the man that is truly penitent, so rare is also the man who truly buys indulgences, i.e., such men are most rare. 32. They will be condemned eternally, together with their teachers, who believe themselves sure of their salvation because they have letters of pardon. 34. For these “graces of pardon” concern only the penalties of sacramental satisfaction, and these are appointed by man. 35. They preach no Christian doctrine who teach that contrition is not necessary in those who intend to buy souls out of purgatory or to buy confessionalia. 36. Every truly repentant Christian has a right to full remission of penalty and guilt, even without letters of pardon. 37. Every true Christian, whether living or dead, has part in all the blessings of Christ and the Church; and this is granted him by God, even without letters of pardon. 38. Nevertheless, the remission and participation [in the blessings of the Church] which are granted by the pope are in no way to be despised, for they are, as I have said, the declaration of divine remission. 39. It is most difficult, even for the very keenest theologians, at one and the same time to commend to the people the abundance of pardons and [the need of] true contrition. 40. True contrition seeks and loves penalties, but liberal pardons only relax penalties and cause them to be hated, or at least, furnish an occasion [for hating them]. 41. Apostolic pardons are to be preached with caution, lest the people may falsely think them preferable to other good works of love. 42. Christians are to be taught that the pope does not intend the buying of pardons to be compared in any way to works of mercy. 44. Because love grows by works of love, and man becomes better; but by pardons man does not grow better, only more free from penalty. 45. 45. Christians are to be taught that he who sees a man in need, and passes him by, and gives [his money] for pardons, purchases not the indulgences of the pope, but the indignation of God. 46. Christians are to be taught that unless they have more than they need, they are bound to keep back what is necessary for their own families, and by no means to squander it on pardons. 47. Christians are to be taught that the buying of pardons is a matter of free will, and not of commandment. 48. Christians are to be taught that the pope, in granting pardons, needs, and therefore desires, their devout prayer for him more than the money they bring. 49. Christians are to be taught that the pope’s pardons are useful, if they do not put their trust in them; but altogether harmful, if through them they lose their fear of God. 50. Christians are to be taught that if the pope knew the exactions of the pardon-preachers, he would rather that St. Peter’s church should go to ashes, than that it should be built up with the skin, flesh and bones of his sheep. 51. Christians are to be taught that it would be the pope’s wish, as it is his duty, to give of his own money to very many of those from whom certain hawkers of pardons cajole money, even though the church of St. Peter might have to be sold. 52. The assurance of salvation by letters of pardon is vain, even though the commissary, nay, even though the pope himself, were to stake his soul upon it. 53. They are enemies of Christ and of the pope, who bid the Word of God be altogether silent in some Churches, in order that pardons may be preached in others. 54. Injury is done the Word of God when, in the same sermon, an equal or a longer time is spent on pardons than on this Word. 55. It must be the intention of the pope that if pardons, which are a very small thing, are celebrated with one bell, with single processions and ceremonies, then the Gospel, which is the very greatest thing, should be preached with a hundred bells, a hundred processions, a hundred ceremonies. 56. The “treasures of the Church,” out of which the pope. grants indulgences, are not sufficiently named or known among the people of Christ. 57. That they are not temporal treasures is certainly evident, for many of the vendors do not pour out such treasures so easily, but only gather them. 58. Nor are they the merits of Christ and the Saints, for even without the pope, these always work grace for the inner man, and the cross, death, and hell for the outward man. 59. St. Lawrence said that the treasures of the Church were the Church’s poor, but he spoke according to the usage of the word in his own time. 61. For it is clear that for the remission of penalties and of reserved cases, the power of the pope is of itself sufficient. 62. The true treasure of the Church is the Most Holy Gospel of the glory and the grace of God. 63. But this treasure is naturally most odious, for it makes the first to be last. 64. On the other hand, the treasure of indulgences is naturally most acceptable, for it makes the last to be first. 65. Therefore the treasures of the Gospel are nets with which they formerly were wont to fish for men of riches. 66. The treasures of the indulgences are nets with which they now fish for the riches of men. 67. The indulgences which the preachers cry as the “greatest graces” are known to be truly such, in so far as they promote gain. 68. Yet they are in truth the very smallest graces compared with the grace of God and the piety of the Cross. 69. Bishops and curates are bound to admit the commissaries of apostolic pardons, with all reverence. 70. But still more are they bound to strain all their eyes and attend with all their ears, lest these men preach their own dreams instead of the commission of the pope. 71. He who speaks against the truth of apostolic pardons, let him be anathema and accursed! 72. But he who guards against the lust and license of the pardon-preachers, let him be blessed! 73. The pope justly thunders against those who, by any art, contrive the injury of the traffic in pardons. 74. But much more does he intend to thunder against those who use the pretext of pardons to contrive the injury of holy love and truth. 75. To think the papal pardons so great that they could absolve a man even if he had committed an impossible sin and violated the Mother of God — this is madness. 76. We say, on the contrary, that the papal pardons are not able to remove the very least of venial sins, so far as its guilt is concerned. 77. It is said that even St. Peter, if he were now Pope, could not bestow greater graces; this is blasphemy against St. Peter and against the pope. 78. We say, on the contrary, that even the present pope, and any pope at all, has greater graces at his disposal; to wit, the Gospel, powers, gifts of healing, etc., as it is written in I. Corinthians xii. 79. To say that the cross, emblazoned with the papal arms, which is set up [by the preachers of indulgences], is of equal worth with the Cross of Christ, is blasphemy. 80. The bishops, curates and theologians who allow such talk to be spread among the people, will have an account to render. 81. This unbridled preaching of pardons makes it no easy matter, even for learned men, to rescue the reverence due to the pope from slander, or even from the shrewd questionings of the laity. 90. To repress these arguments and scruples of the laity by force alone, and not to resolve them by giving reasons, is to expose the Church and the pope to the ridicule of their enemies, and to make Christians unhappy. 91. If, therefore, pardons were preached according to the spirit and mind of the pope, all these doubts would be readily resolved; nay, they would not exist. 92. Away, then, with all those prophets who say to the people of Christ, “Peace, peace,” and there is no peace! 93. Blessed be all those prophets who say to the people of Christ, “Cross, cross,” and there is no cross! 95. And thus be confident of entering into heaven rather through many tribulations, than through the assurance of peace.